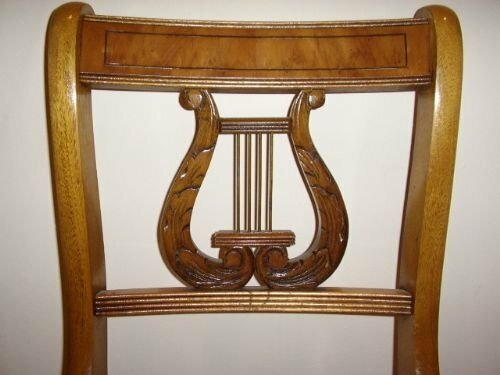 REGENCY STYLE ANTIQUE FLAME MAHOGANY EXTENDING DINING TABLE & SIX MATCHING HARP BACKED CHAIRS. 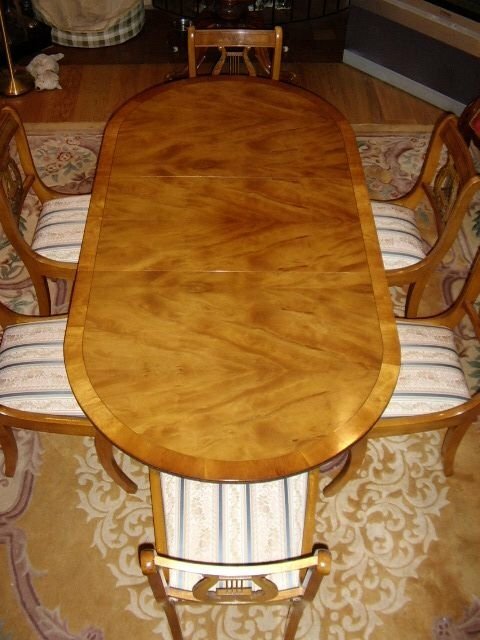 This is a beautiful Quality Regency style Dining Table Set dating from around 1970. 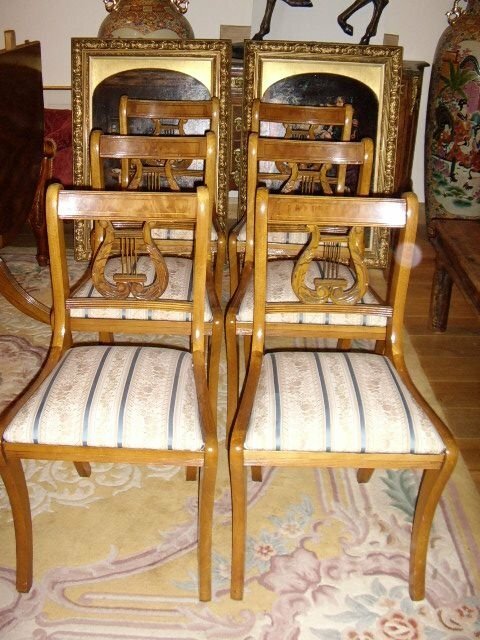 The set consists of six matching Harp Back Chairs and a fabulous Extending Twin-Pedistal Dining Table with 'D' shaped ends. 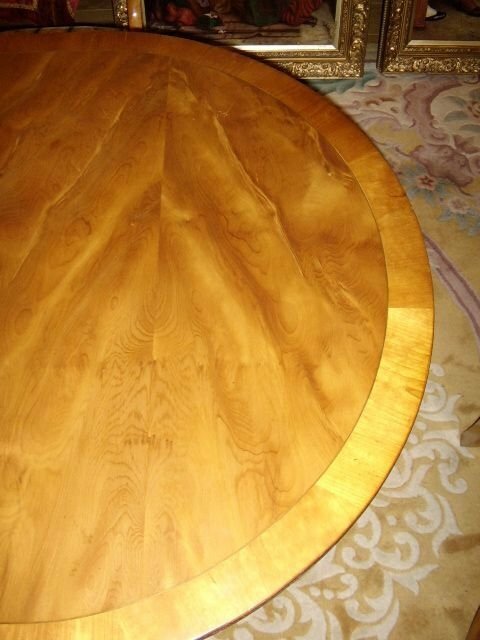 There is a removable central leaf which reduces the tables length from 6ft extended to 4.5ft. The Dining Table is finished in a golden coloured flame mahogany french polished veneer which displays magnificently the pattern of the grain. 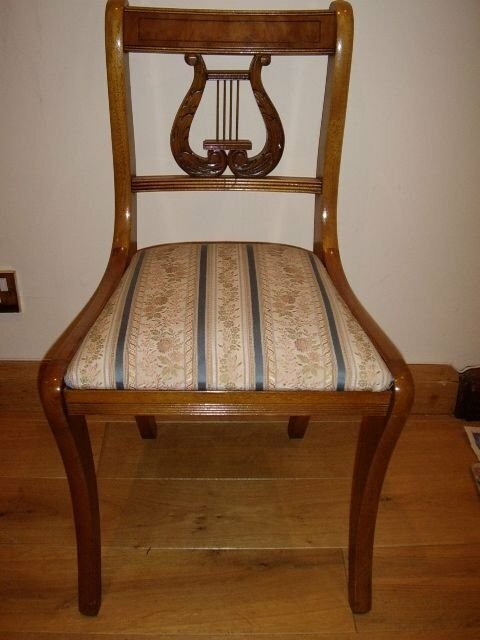 The Chairs are upholstered in a Regency Blue & Gold stiped pattern with florrel design between the bands.All exceptionally clean and with no ware. All the chairs slide easily under the table to provide ample room to pass. MEASUREMENTS: TABLE 6ft. x 3ft. Extended. The condition is excellent throughout. DELIVERY UK MAINLAND ONLY/Quotes available.